A Christmas wreath is a symbol of a welcoming home and therefore is most commonly found on the front door of a house. As with many Christian rituals it pre-dates the birth of Jesus and has it origins in pagan and Roman times. A light surrounded by a circle of evergreens was made in the hope that the dark days would end and the light and life of spring would soon come. The Romans used wreaths as a sign of victory to be worn on the head. Sometimes afterwards they would be hung on a door. In Christianity a wreath was first used to start the Advent period and the coming of Christ. The evergreen plant and leaves used symbolise the natural world and the everlasting life. A circular shape is used to represent God as stated in Revelation 22:13, “I am Alpha and Omega, the beginning and the end, the first & the last.” A candle is lit at least each Sunday in the four Sundays preceding Christmas Day with the final white candle, representing the birth and purity of Jesus, is lit on Christmas Day. As with many Christmas customs wreaths were thought to be too pagan and also too Catholic for the Puritans during Oliver Cromwell's reign and were banned. Once the monarchy was restored wreaths were allowed again at all times of the year. 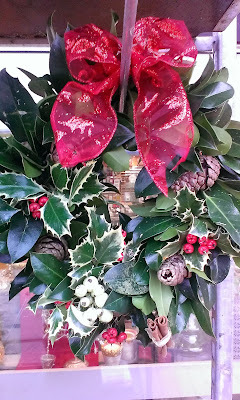 The hanging a wreath on a front door is still popular today. While evergreens are still used, either fresh or artificial, other designs with baubles or pompoms have also become fashionable.